This low villa is a peaceful place where you can come from adults but also with your children. The proper term to define it would be the country in the city; you will be the victim of a change of scenery. 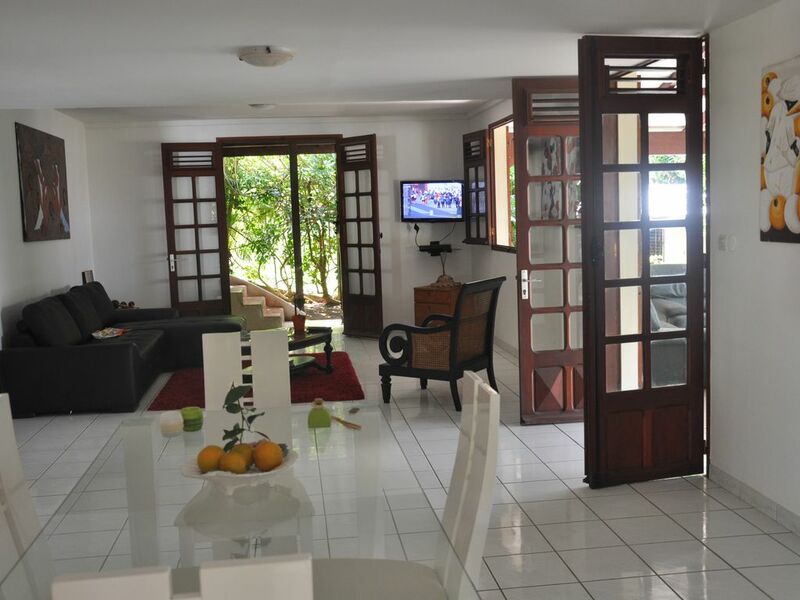 As you can see from the photographs you have at your disposal a large kitchenette, a more than pleasant stay, unbeatable terrace, 2 bedrooms with themes and 2 bathrooms, one with its shower massage jets and to top it all a little toilet outside for nature lovers. You will be able to park your car inside and connect to the wifi at your disposal. You are at the Mahogany area in which remember LAMENTIN is in the center of Martinique. At two minutes from the largest shopping center of the island but also 5 minutes from the city center location or you can visit our beautiful covered market, shopping, stroll along our beautiful Malécon (large square facing the sea with games for children). The nearest beach is 7 minutes you will feel in the middle of everything. All this without forgetting a warm welcome. Maison agréable bien située pour visiter l’ile !